De Waal (pop. 188 in 2001), a village on the Dutch island of Texel, where there were three Mennonite meetinghouses in the 17th century — Waterlander, Frisian, and Flemish; the groups at De Waal using these meetinghouses were not independent congregations, but each more or less united with their respective congregations at Den Burg. 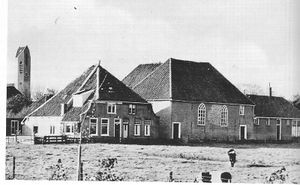 In 1772 all the Mennonite congregations of Texel except Den Hoorn merged into one single congregation called the Burg-Waal-Oosterend congregation. Thereupon the Frisian meetinghouse at De Waal was torn down (the Flemish meetinghouse had been abandoned at an earlier date) and the Waterlander meetinghouse only was left. Built in 1723, it was remodeled in 1842 and is was used until 1974, when it was demolished. In the 19th century sometimes one of the preachers of the united congregation lived at De Waal. At present the Mennonites of De Waal belong to the Texel congregation, embracing all Mennonites on the island, including those of Den Hoorn. At De Waal there is a separate ladies' circle, a Sunday school for children, and a boys' club. In 1649 Elder Claes Arentsz of Nieuwe Zijpe irritated the Reformed in his baptismal sermon at De Waal, which led to a religious disputation. Cate, Steven Blaupot ten. Geschiedenis der Doopsgezinden in Holland, Zeeland, Utrecht en Gelderland, 2 vols. Amsterdam: P.N. van Kampen, 1847: v. I, 195. Doopsgezinde Bijdragen (1872): 195; (1873): 142, 143, 149. Zijpp, Nanne van der. "De Waal (Noord-Holland, Netherlands)." Global Anabaptist Mennonite Encyclopedia Online. 1959. Web. 23 Apr 2019. http://gameo.org/index.php?title=De_Waal_(Noord-Holland,_Netherlands)&oldid=126105. Zijpp, Nanne van der. (1959). De Waal (Noord-Holland, Netherlands). Global Anabaptist Mennonite Encyclopedia Online. Retrieved 23 April 2019, from http://gameo.org/index.php?title=De_Waal_(Noord-Holland,_Netherlands)&oldid=126105. Adapted by permission of Herald Press, Harrisonburg, Virginia, from Mennonite Encyclopedia, Vol. 4, p. 865. All rights reserved. This page was last modified on 12 October 2014, at 16:38.